Last weekend, football fans across America were given a treat! Two great games with the greatest players playing the sport competing to see who gets a shot to play in the Super Bowl! The first game, the AFC Championship Game, featured a duel between two of the greatest quarterbacks to ever play the game, media darlings, Tom Brady and Peyton Manning. The Denver Broncos, lead by Manning would go on and defeat the New England Patriots anti-dramatically and get a shot to win the NFL Championship. The next game, the NFC Championship Game, between the San Francisco 49ers and Seattle Seahawks, was much more hotly contested and featured an ending that won’t soon be forgotten fortunately… and unfortunately. A back and forth game throughout, the Seattle Seahawks held a narrow six point lead with the 49ers driving down field looking for the go-ahead score. With less than 20-yards to go to the endzone, San Francisco quarterback, Colin Kaepernick takes a snap and throws the ball to the back corner of the endzone to his top receiver, Michael Crabtree. Just as Crabtree leaps in the air to make the catch, the ball was swatted from his grasp and tipped to a defender causing a crushing game-ending interception. The deflection was caused by All-Pro Stanford University graduate Richard Sherman. Naturally, the guy being interviewed was called everything under the sun during his day. Now, the entire world readily recognizes him as “The Greatest”, not just himself. 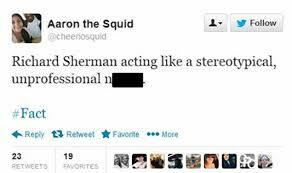 But in the aftermath of the NFC Championship game, everyone had an opinion to share about Richard Sherman. He’s suddenly become a villain, a classless, violent, thug completely unnatural to the sport he plays, much like Muhammad Ali. 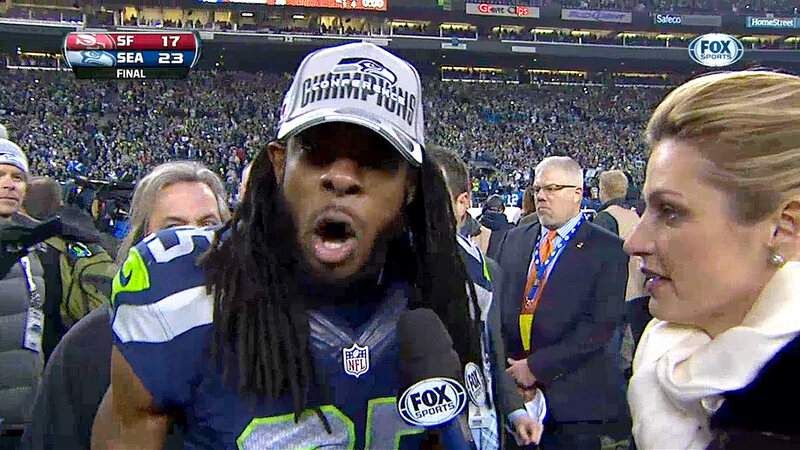 The New York Daily News had an article written, after the game was over, describing Sherman “bug-eyed” and screaming. Which was not only grossly negligent of the fact that his eyes were indeed shaded by the Championship hat he was wearing, but the writer immediately harkened back to a time where images of black minstrel caricatures were drawn with bulging eyes, shucking and jiving loudly senselessly. 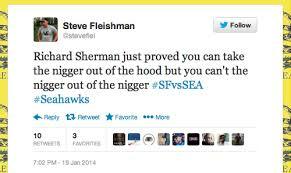 Now, it is very possibly that I could be reading too far into these words and characterizations of Richard Sherman. But when you look at the landscape of sports, the day before a hockey game, which is no stranger to senseless violent acts, senselessly starts(literally) with a brawl by all players on the ice. 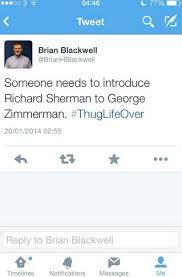 But Richard Sherman, a dual sport collegiate athlete and All-American is a thug… for making a good football play. A few years back, college football coach Mike Gundy had a press conference in response to an article that was written about a player he benched during a season. What ensued was three whole minutes of him yelling at and shaming the reporter who wrote the article. Mike Gundy goes on, wins conference titles and continues a successful coaching career, while Richard Sherman, who decided NOT to enter the NFL Draft to continue his education is a thug. Two years ago, the opposing coach from the NFC Championship Game and Richard Sherman’s former college football coach, Jim Harbaugh ends a game with the Detroit Lions by aggressively snatching the Lion’s coach’s hand in a post game handshake nearly igniting an all out brawl by both coaches and teams. Jim Harbaugh is passionate, while Richard Sherman, an well-spoken man with a college degree in Communications and pursuing a Masters Degree is a thug. Baseball managers like Billy Martin and Lou Piniella have made careers out of going onto the field of play and getting into screaming matches with umpires on a nightly basis. They’re know as some of baseball’s greatest managers, but Richard Sherman, a former Salutatorian and scholar-athlete is a thug. He’s a thug because he trash-talked another player? Something that literally happens in EVERY sport the moment an athlete step onto the field. Or is he a thug because he’s overly excited, energized because he’s LITERALLY at the pinnacle of his career? Or, as he and others speculate, is he a thug because it’s no longer politically correct to call him n—–? Maybe I’m over-reacting. Maybe I’m reading too much into this. 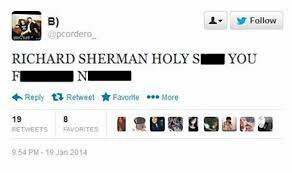 What I’m not reading too much into is Richard Sherman’s Twitter Feed. Refreshing little gems of commentary to read the day after the biggest day of his career thus far; i.e. MARTIN LUTHER KING JR. DAY. But hey, these are just some isolated little idiots and not reflective of our general society as a whole right? Sure. It’s a shame though. Yeah, some things could just be me over-thinking things in my head. Some things could be me seeing this as they shouldn’t be. Sadly though, there are other things, we seem to not be able to get past. It has stayed with us and hasn’t allowed us to live as one. We’ve come a long way in America. Sports, which has often been vilified as an amateurish unadult way for the under-educated and overly capitalistic to make a lot of cash. But it also has been seen as the ultimate meritocracy, where your own merits and ability, not your race or status, determines how much you achieve. Sports have been famous for uniting us under banners of common support despite our inherent differences. But through it all, as much as we would like, not all of it can be left out of the proverbial locker room. As much as I would rather it not, race is still as big of a number one player in “America’s Game” as it was 50 years ago. Unfortunately, we’ve come a long way, but we still struggle to leave these silly little kids games where they belong: in the past! Fifty years ago, last August, Martin Luther King, Jr. stood on the steps of the Lincoln Memorial and gave a speech. Unlike the many other moments in American history that has shaped American history, this speech has been watched and re-watched by Americans and the message delivered on that day and for the years of Dr. King’s life has been grounded to the foundation of this nation as much as any other. As a nation, we had to overcome a lot to be able to accomplish as much as we have. As much as any politician, soldier or Founding Father, Martin Luther King Jr. allowed for this to happen. Twenty years after this speech, after the largest petition campaign in American history and the overwhelming support from Congress, the celebration of the life and birth of Martin Luther King Jr. was made into a federal holiday, recognizing the only private citizen in American History to have the honor. All because the man had the audacity to dream an impossible dream. Sadly, that is what it has become; the impossible dream. This week, I was involved in a conversation with someone who is white, talking about her five year old daughter, who learned about the life and death of Martin Luther King, had for the first time in her life began to recognize and discern racial differences of those around her. Naturally, her mother who raised her daughter right, had no desire to teach her that one race is different or better than another and that we are all equal. So she was dismayed at the fact that her daughter, who had never spoke of any racial differences in her life, had now saw these differences and more specifically what it meant. What she does not realize is, no matter how she felt about her daughter’s epiphany, black folks had to realize this truth very early in our lives. This reminder can be frivolous and out of place. It can be shocking and aggravating. And it can also be humiliating and shaming. Growing up, black kids across America have remarkably similar experiences living in a world where we are the minority. It might be petting and touching of our hair or automatically being the bad guy/Indian/robber in chase games or being picked first in basketball. It could also be being told you’re not as pretty or you’re cute “for a black guy/girl” or being told “I don’t date black guys” or just having that inexplicable feeling of being different and apart. This is the world we live in. As much as we want to be normal and live a life more ordinary, these constant reminders that start well before we remember lasted throughout our childhoods and never really end. No, this is not a suggestion that anyone is born inherently racist. What I am suggesting is that the world that Dr. King dreamed of has not been achieved and in this nation, on this day, we have to accept the reality of our differences. More than accepting them, on this day, Dr. King has given us the opportunity to experience them, learn from them and most importantly, celebrate them. On a whole, this is the one dream of Dr. King’s that we have not achieved and if we were to take these moments of our lives as a barometer, we still have a long way to go. Every time I hear someone tell me, “I don’t see color,” the dream gets harder. Every time I hear someone say “I don’t see you as black,” the dream gets tougher. Every time I’m told “Well, you’re not really black,” the dream becomes bleaker. The more I’m told these things, the more other black youths hear these things, the more I realize that Martin Luther King’s Dream is still out of reach. Because as much as others around me have not accepted our differences, I have. And so should everyone else. Though, like many other black youths, it has taken some time, more time than it should or you can expect, I am comfortable with being black. Are you? I am black. And I expect it to be recognized. However, I also expect it to be accepted, and celebrated. I am black as much as I am a man. I am black as much as I am American. Most notably, I am black as much as I am friendly. I'm a prisoner of words unsaid. Mostly I say what you wanna hear. On a drug of complacency and compromise? It'd be easier if you put me in jail. If you locked me away. I'd have someone to blame. But these bars of steel are of my making. My hands are cuffed behind my back. I'm a prisoner of the worst kind, in fact! A prisoner of my youth. Run too fast to be old. I've forgotten what I was told. A prisoner of age dying to be young. It's like solitary confinement every time I stay quiet.